You must make reservations at least 5 minutes in advance of the time at 1776 Restaurant. Between McHenry Ave. and Dole Ave.
Family owned restaurant in Crystal Lake, IL. Specializing in great wines, locally sourced farm to fork food. Catering to those with food allergies, especially since the owner has Celiac Disease among other dietary Restrictions. Owner Rhienna, super passionate about her community. We are re-defining what fine dining looks like and building community through food. It's an exciting time for 1776 to pioneer into the future of Farm to Table offerings. Wine Spectator Award of Excellence Award 2018 winnerr. We had anniversary dinner there and it was an overall great experience. The stuffed poblano was amazing! Great apps and wine choices. Dessert was good, but I do wish the crepe brûlée was served warm. Our server was absolutely wonderful! Always amazing! Loved the wine selection with olthe scallops and octopus nosh! Outstanding! Loved the food and wine and loved the service. Food good but meatloaf & chicken flatbread a little bland. Fantastic birthday dinner date! We shared the Ahi Tuna Tartare appetizer and couldn't finish it! My husband ordered steak and I had the Sea Bass special... Both were cooked perfectly. We look forward to dining there again! We go often and there is no reason to change. Once again superior in the area. I have eaten at this restaurant 5-6 times the food is always top quality and service is impeccable. I highly recommend this restaurant for any occasion. There were a couple of large parties this past experience and the noise level was a bit higher then in the past but still an enjoyable evening . . .
We love the ambiance, food and service here. Love the white table cloths and overall look of this friendly restaurant. We were seated promptly in a great location of this small dining area (thanks to a reservation made through Open Table). Our wait staff was very attentive and informed. Salad was amazing - mixed greens with blue cheese dressingon one and raspberry vinaigrette on the other. We ordered calamari (fried-very good and little crisp), and the smoked trout and smoked salmon. Main course was a generous portion of baked trout and the special for the day (Friday) 14-oz T-bone (from Pleasant Acres in Marengo, Illinois). Both were exquisite! Dessert was chocolate flour-less cake (so decadently delicious!) and raspberry cheese cake. Coffee was very good also. Leftover carry out was handled efficiently with a high quality of containers and bags. Food tastes great, attentive, but not overbearing service. Good suggestions when asked. We'll visit again. Bring on the Sunday "wine glasses" event! Amazing service from all from beginning to end! Food was great....appreciated the gluten free selections and quality! Even a very tasty cider! This was the second time in a few weeks that I have dine at 1776. The first time was excellent as well as the second time. Service was superb. We had not eaten there in years and we really appreciated the updating and food selection. We had heard that it was very noisy since the remodel, but with the new ceiling and baffels the sound was very acceptable. We intend to recommend and take friends to dine there also. Excellent food and service as always. Staff is knowledgeable about food allergies. The chef was able to make the cream lobster sauce with coconut milk to accommodate dairy free. It was delicious! Thank you for providing a place for me to eat out without worrying about getting sick! The service, food, and atmosphere was wonderful! 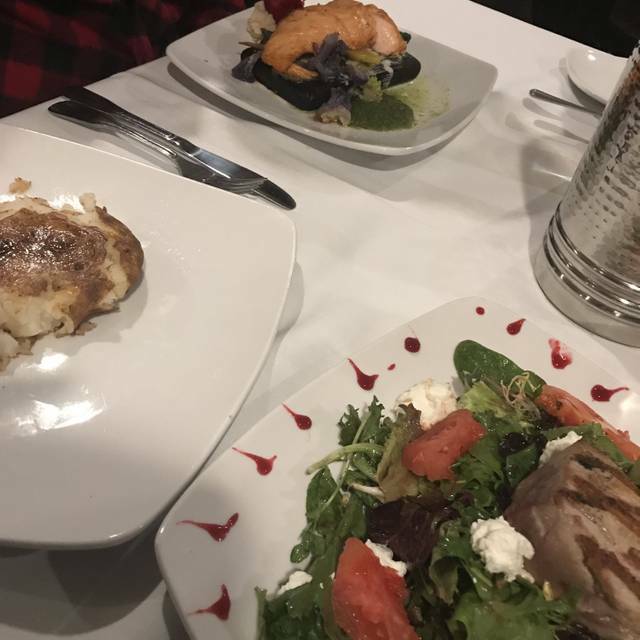 They fully accommodated my husband’s gluten sensitivity and we were able to enjoy the same meal along with a half priced bottle of wine. Every employee was polite and made us feel welcome. We had a wonderful experience! Most of our meal, from drinks to appetizers and entrees, was excellent. Unfortunately, the pork chop, although tasty, was quite tough. The lamb, coconut shrimp with peanut sauce, and the vegetables were outstanding. The main reason I gave a lower rating had to do with service. The busing was perfect, but our actual waitress was quite slow and a bit unattentive. The service and food was excellent. My only complaint was the noise level was quite high and we actually had a hard time hearing each other from across the table. We had a wonderful time at 1776 on a Saturday night in March. We loved the decor and vibe . The waitress was a tad bit slow with drink refills but it was busy so that might explain it. The food was delicious! I had the Rainbow Trout and it was done to perfection! My husband ate a generous portion of the Shrimp Fettuccine and loved it. 1776 is a treasure to find. Overall the restaurant atmosphere is welcoming. 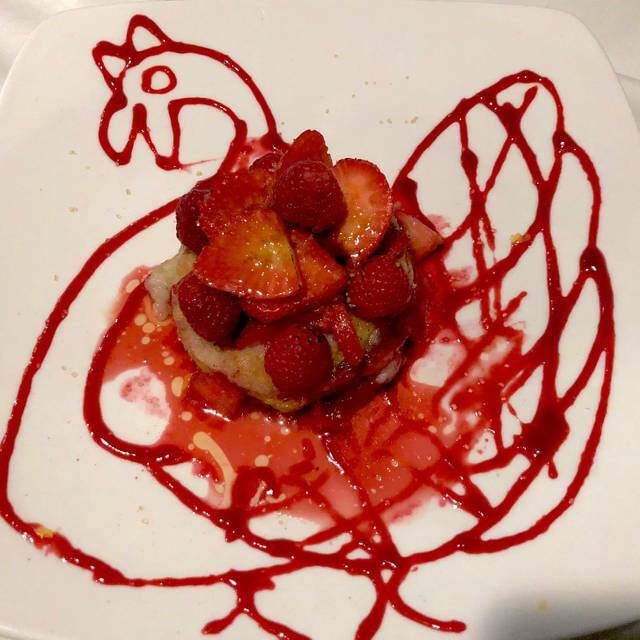 From the hostess to the waitress and servers, everyone was pleasant and service was exceptional for a busy night. Favorite meals ordered at our table were braised short rib and the wild game trio. Peanut butter dessert is a must. Thanks Rhienna for your hospitality. Love your place.. we will be back. This was our first time back after new ownership. It was very loud at first until a certain party left. I had the wild game trio and found it tough and not as tasty as I have had in the past. Very disappointing. Salad and crab cakes were delicious. Service was extraordinary and all courses were served in a very prompt fashion. I would want to come back and try it again before recommending it to someone else. 1776 has greatly improved the placement of tables and has added acoustic tampering materials to soften the noise levels. These two changes will bring us back. The food was fabulous! Service exemplary. A little noisy but not enough to to keep me from returning. Very consistent, delicious menu, so many varieties to choose from. The black bean puree soup is one of my favorites. So many things on the menu I want to try... keeps me coming back. Excellent overall. Would recommend. Has the lamb shank. Oh my it was delicious! I took a friend to 1776 celebrating their birthday. I failed to let the waitress know about the birthday, and happened to see them bring out a small cake to another customer celebrating a birthday. I mentioned to my friend that I was sorry that they wouldn't get a piece of cake because I didn't advise the restaurant. Our waitress heard me say that, and after the meal she brought a piece of cake out for my friend. That was very nice of her to do that, and was most appreciated. This was our second time here. Everything about it is classy, decadent, and satisfying. Great drinks, delicious food, and beautiful presentation. Pricing is good for what you receive as well. Highly recommend! Great food & service. Sarah was our server, she did a great job! Locked on service is hard to find, she nailed it! Our favorite place to eat since we moved to Crystal Lake in 2018!!! Food was amazing! My husaband and I love this restaurant! We have been there many times!! My wife and I had a wonderful time. We enjoyed the space, great drink pairings, attentive service, and delicious food. We will be back. Thank you. Had personal interactions with the owner, lovely woman. Told her that I knew her new head chef and she escorted me back to her kitchen to say hello, even on a busy night! Super friendly and accommodating staff. They remembered that my wife was vegetarian and were prepped for that when we arrived. Super high class, but not all menu options are bank breaking. Everything you get is made in house, even the deserts they bring out at the end of the meal. New favorite restaurant! This was our first time at 1776, but it will not be our last. The service was wonderful, and the food was delicious. It is on the expensive side, but makes sense with the quality of food. They have an excellent wine list, and a great selection of beer. We look forward to coming back soon. Took my husband for his birthday. Place is charming, staff is friendly and attentive and food was spectacular. Very pleased with portions vs cost and looking forward to going back to try another entree. However, the cheese plate is going to be a standard free m here on out!! My rack of lamb was a bit chewy and had to be re-fired - too rare for me, despite my request for medium to medium-well. 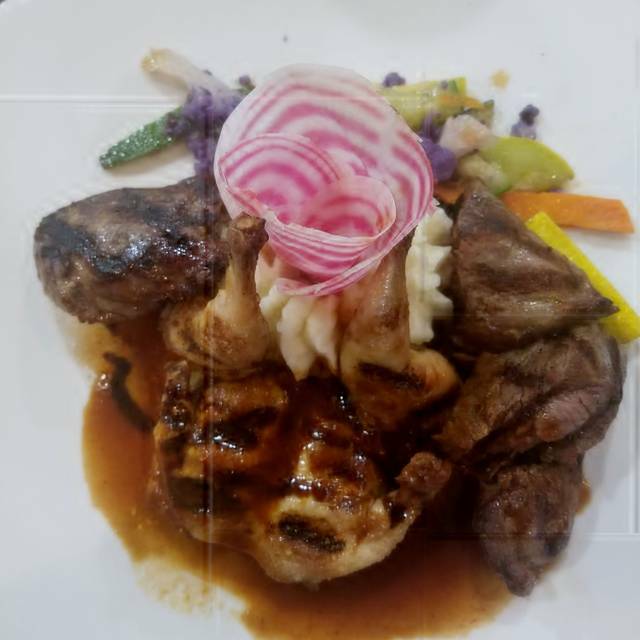 The lamb dish was "deconstructed" - basically meaning a few bland chops with a savory wine sauce on the side and a few veggies tucked underneath the lamb chops. However, according to my partner, there was no problem with his meal. He really enjoyed his steak. I don't know....already enjoyed 1776 in years past as it was always a unique restaurant with unusual types of food - like venison, etc. Now just becoming another run of the mill farm to table restaurants that are popping up everywhere. They do offer a special chef's menu (they recently hired a new chef) which had some interesting offerings. I would definitely return and try something different...the lamb just didn't do it for me. But the service was fantastic and my server couldn't be more accommodating. 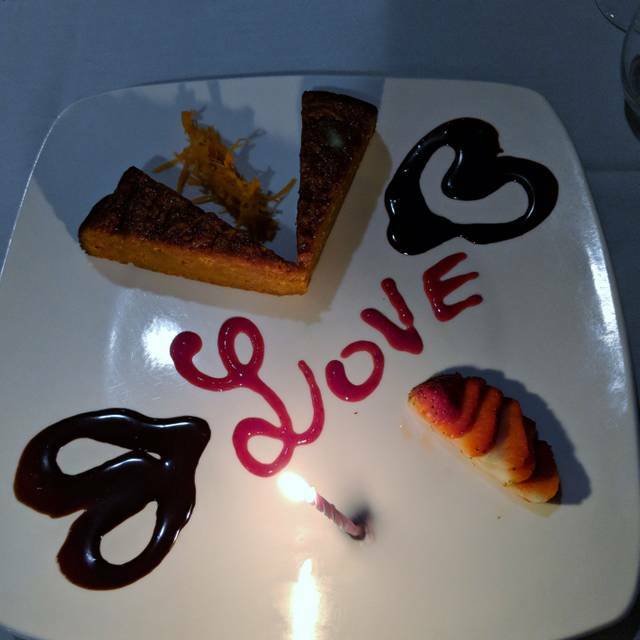 We shared a nice complimentary dessert presentation for my partner's birthday. Love that there are dedicated gf and vegan options. Great quality and value. Will definitely be returning . This was our first time at 1776. The food was good but Nothing I would rave about like other restaurants that I’ve been to. 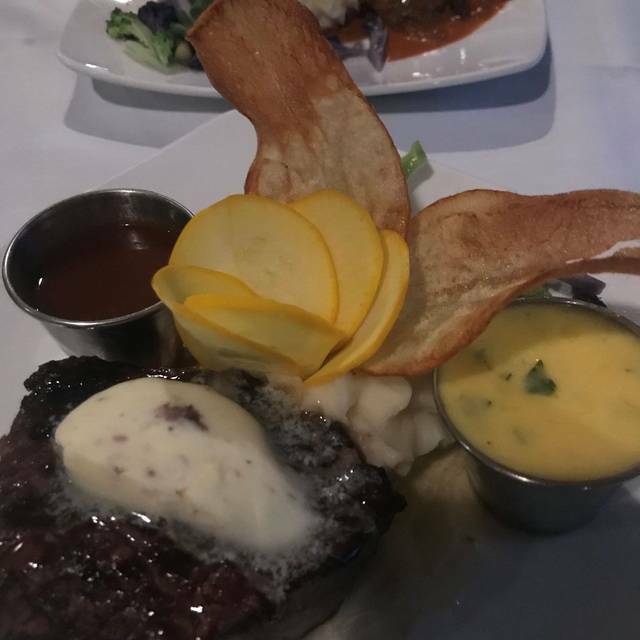 My husband had the rack of lamb which came with mashed potatoes and veggies - I had the filet and it was paired with the same. Both the filet and lamb were flavorful. The mashed potatoes were Luke warm and nothing special in taste. Veggies were cooked well but they were just veggies - again nothing special in taste. The salad came with mixed romaine and spinach with about a 1/2 TBS of shredded carrots. I was underwhelmed by the lack of toppings (a tomato, a cucumber, a radish, something in addition to shaved carrots would have been nice. We had the coconut shrimp for an appetizer. The noodles that came with it were by far the highlight of the entire meal. The spicy peanut sauce was delicious. Overall, The food was good but for the price I expected it to be exceptional. For me and my husband, it was “meh”. We love their food and wine! The atmosphere is awesome and so were the staff! Our experience was outstanding! All the food we ordered was cooked to perfection and the taste was incredible. Our server was awesome and took really good care of us! We will 100% be back!